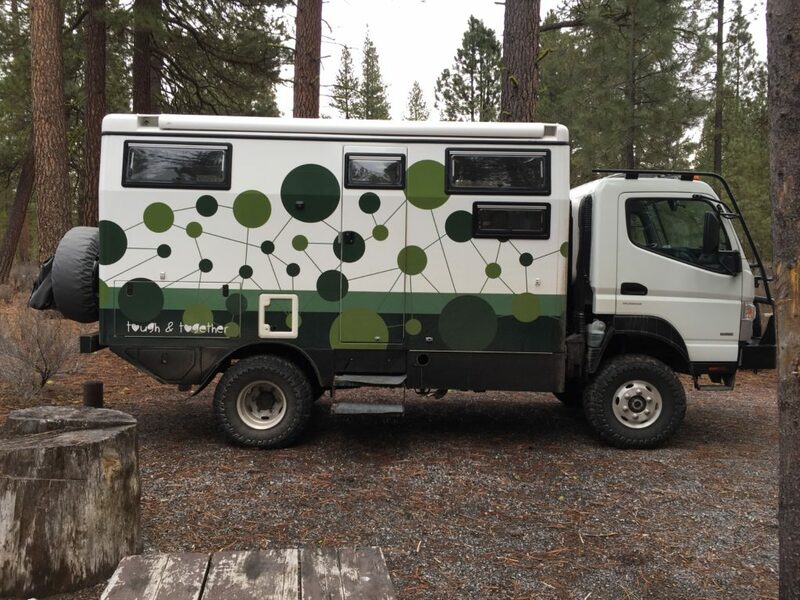 The EarthCruiser FX is a really good-rugged-looking vehicle with clean lines and a well thought-through design. In it’s new-born state it is gleaming white. As the date for picking up Molly drew closer, we started thinking of possibly putting something on the sides: an outline, a picture, …. we weren’t too sure. Eventually we came up with grey dots on one side and ‘Arrival’ (as in the sci-fi movie) logograms on the other side. 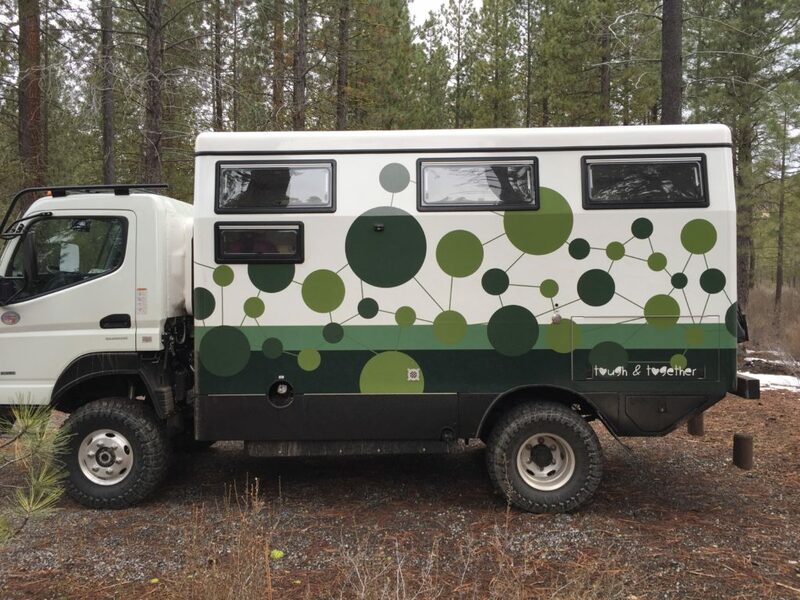 We found ‘Driving Force’ a company in Bend, OR, that had wrapped (that’s what it’s called) EarthCruisers before, so we contacted them. It took a bit of date juggling, but eventually we got a slot for the wrap on March 12th, kinda perfect timing. 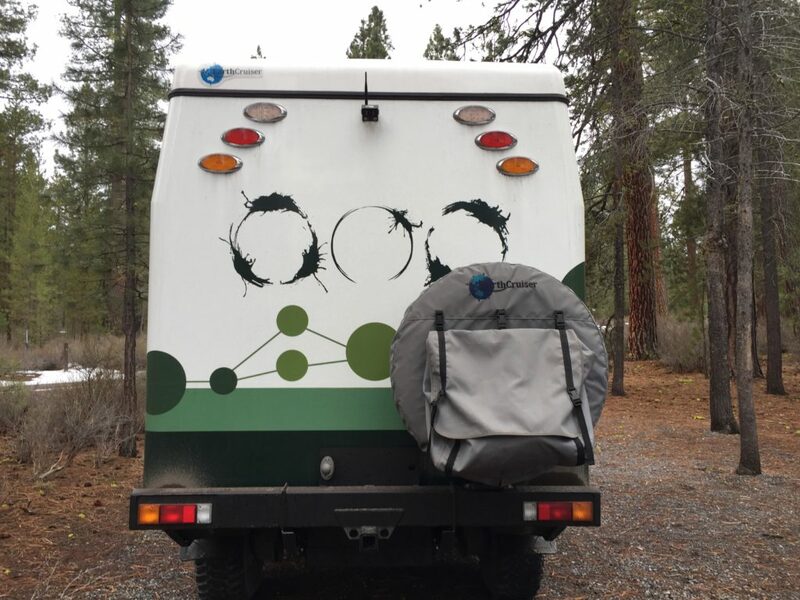 One evening while finalizing our design for the wrap, we looked at each other and almost simultaneously pondered what a bit of color could do, after all grey is just… well… grey. So, after 2 weeks of calls, emails and file exchanges with Driving Force, we changed the grey to green and came up with a color combination we really liked. In that same final hour of designing we also decided to have dots on both sides and the logograms on the back. For the green we looked at ‘forest color palettes’ and made a combination we like. Green represents life, growth, earth, happy, forest, trees, plants, cool, shade, …. The connecting lines are for journey, travel, connecting places, people, experiences, ….The logograms are from the movie ‘Arrival’ and represent, fltr: Time – Life – Earth. Yep, we’re nerds. ‘Tough & Together’ became our motto while backpacking through Africa and it has been ever since: as long as we are ‘tough and together’ we can handle anything. It is also the inscription in our wedding rings. We couldn’t be happier with the excellent work done by Driving Force. Thank you Stephanie and Darren (the two people we dealt with over the phone) and everyone!